When we examine the asymmetric threats facing humanity, it becomes clear that major challenges -- whether local, national or international -- are all tied together by the exponential function! A lack of appreciation for what exponential increase really means leads our society to be disastrously sluggish in acting on critical issues. Believe it or not, our great survival struggle -- manifest via Demographics, Energy and The End Game -- is about understanding the practical meaning and effects of the exponential function! What is the Exponential Function? Simply put, the exponential function means growing like this: 1, 2, 4, 8, 16 and 32. Doubling, doubling again and then doubling again and again. Everyone surely understands that? Yes, at a theoretical level, and No, at a practical level! For example: suppose one agrees to eat one almond on the first day of the month, two almonds on the second, four almonds on the third, eight almonds on the fourth, and keeps doubling them every day. How long can one keep going? How long will a pound of almonds last? The first pound of almonds will be gone on the ninth day as one eats the remaining half of the pound. On the tenth, day one will eat a whole new pound of almonds. By the fifteenth day, one will be expected to eat 32 pounds of almonds! One will have to eat roughly one's own weight in almonds by the 17th day! On the 21st day the total will have risen to one ton, roughly the weight of a car; and by the end of the month, assuming a 30-day month, it will be 500 tons, or the weight of a ship! 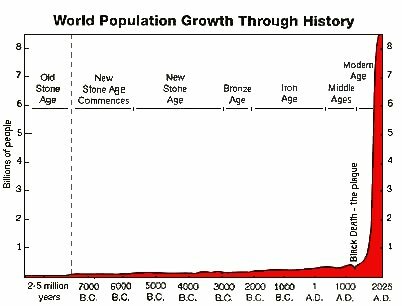 The human population of Earth reached 1 billion in 1804, 2 billion in 1927, 3 billion in 1959, 4 billion in 1974, 5 billion in late 1986 and 6 billion in late 1999. We are presently on the cusp of reaching 7 billion. Mexico, with a population of 107 million and a doubling time of 70 years, will, if it keeps that up, grow to 214 million in seven decades. That's nothing compared to Kenya, which has a doubling time of 26 years. If Kenya goes on growing at its present rate, in 70 years there will be roughly three Kenyans for every one today! Until the 1970s world oil consumption was growing at seven percent per year. That means doubling every ten years. The doubling time of anything growing exponentially is 70 divided by its annual growth rate — 70 divided by seven percent is a ten-year doubling time. Every ten years we used as much oil as we had used in all previous history. Every ten years we had to go out and discover as much oil as we had ever discovered before — and then, to keep going, discover twice that much in the next ten years. We didn't keep going after 1970 because we couldn't have. In 1973, there was an massive oil shock and that global economic crisis began to alter consumption behaviour. Since then, per capita oil consumption in the US -- which reached a peak in 1978 -- has fallen by 20 percent from that level. As a result, there's still plenty of oil around at present, but we've been burning it faster than we've been discovering it for 20 years now because of the arrival of China, India and other emerging countries as major consumers of oil alongside the G7 and other developed nations. It is well known that we have around a 1,000 years' worth of coal left. However, if we burn 7 percent more of it each year than the year before -- which we may well do, substituting it for the disappearing oil -- it will last just 60+ years, and it will bring on global climate chaos much faster than even the worst case scenario projections! One doesn't get much reaction time when problems grow exponentially and come closer to the end game. An old French riddle illustrates the point: Suppose one owns a pond on which a water lily is growing. The lily doubles in size each day. If the lily were allowed to grow unchecked, it would completely cover the pond in 30 days, choking off other forms of life in the water. For a long time the plant is almost invisible, and so one decides not to worry about cutting it back until it covers half the pond. On what day will that be? On the twenty-ninth day! We are emitting carbon dioxide and several other greenhouse gases in the atmosphere exponentially. We are clearing tropical forest at an exponential rate. The human population is growing exponentially. Human energy use, human production of synthetic products, chemicals, deserts and rubbish are growing exponentially. Many national economies are growing exponentially in terms of x percent GDP growth per annum, and we cheer them on, although a worldwide economic growth rate of, say, 3.5 percent per year means another whole industrial world is added to this one in just two decades! We can't keep it up. If all interlocutors truly understood the consequences of exponential growth, we would have no differences of opinion, no conflicts of interest, within the one world united point-of-view! The Key Question: How to build the escape velocity needed to break free from the current gravitational pull of influences that limit the capacities of leadership? Educate one and all on the practical relevance and power of the Exponential Function as it applies to Demographics, Energy and The End Game!